If you think that scurvy is just about loose teeth, think again. For Distillations (the magazine of the Chemical Heritage Foundation), I tell the crazy story of a disease that killed more than two million sailors between the time of Columbus’s transatlantic voyage and the rise of steam engines in the mid-19th century—and explain how a lot of what you think you know about it is probably wrong. In 2006, David Holtzman decided to do an experiment. Holtzman, a security consultant and former intelligence analyst, was working on a book about privacy, and he wanted to see how much he could find out about himself from sources available to any tenacious stalker. So he did background checks. He pulled his credit file. He looked at Amazon.com transactions and his credit-card and telephone bills. He got his DNA analyzed and kept a log of all the people he called and e-mailed, along with the Web sites he visited. When he put the information together, he was able to discover so much about himself—from detailed financial information to the fact that he was circumcised—that his publisher, concerned about his privacy, didn’t let him include it all in the book. I spent a week trying to live as anonymously as possible and reported on the results in Popular Science. 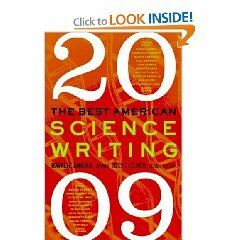 The experiment was hell, but it was worth it: the piece was recently selected for The Best American Science Writing 2009 (HarperCollins). I was also invited to participate in a podcast on the topic.